On 19th February 2013 the Irish Taoiseach Enda Kenny apologised to the women incarcerated in Ireland’s Magdalene laundries. Listening to his words were Nancy, Kathleen, Diane, Marie and Marina, all ‘Magdalene women,’ confined in the state-funded laundries run by the church during the 1950’s, 60’s and 70’s. The harrowing physical and psychological abuse they endured there led to a lifetime of hurt, loneliness, shame and secrecy – but finally the world knew what they had suffered. In Whispering Hope , these women tell their stories for the first time. 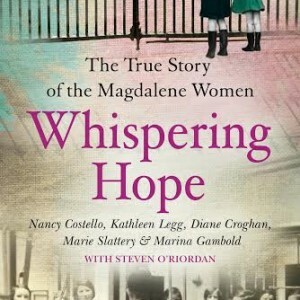 United in their fight for justice by Steven O’Riordan, founder of the group Magdalene Survivors Together, their individual voices interweave in an immensely powerful narrative that shines a light on a dark chapter in Ireland’s History. Inspirational and Moving, this ghost-written story by SUE LEONARD, tells of five women brave enough to confront their past and strong enough not to let it define them. 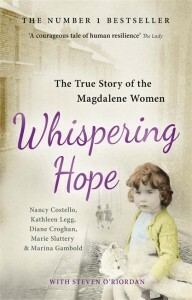 In Association with The Pat Kenny Show on Newstalk 10Whispering Hope is an Eason Book Club Book of the Month for June 6 – 108′.